Last year I wrote about how the swimming world has an unhealthy obsession with Personal Bests [PBs]. And since then I’ve seen countless more examples of swimmers treating non-personal bests as if it meant they were a failure. But I’ve also seen swimmers get unhealthily obsessed with their race times in general. The problem is simple. 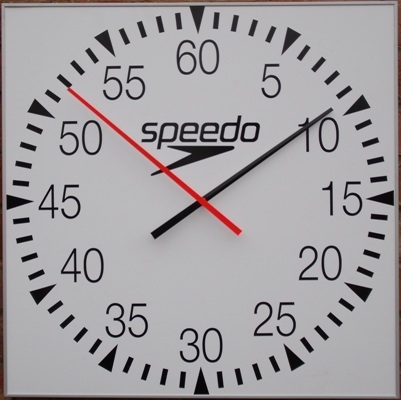 The vast majority of swimmers, and virtually all parents, believe that the time is the only measure of a race. A good time means a good race. A bad time means a bad race. We’ve all heard swimmers come back from a race, upset at the time, and promptly declare that the race was crap. It was all crap. But racing is never that simple. Somehow swimmers never remember the conditions of the race. You can’t really compare a race held roughly one hour after warmups in a fast pool with lots of competition in other lanes, with a race in a slow pool held 15 minutes after you just did a 200, and where you are half a length ahead of, or behind, everyone else in the heat. Drastically different conditions will lead to drastically different times, and yet that becomes ancient history in the hunt for a PB in every race. Remember that not all meets are about times. Most clubs use the idea that swimmers should compete once every 3-4 weeks in order to fine tune their racing skills. There are training meets, and there are big meets. And the key here is that times done at big meets, where the swimmer is tapered and sometimes shaved down, are VERY hard to replicate at training meets. Here’s an example. In December we had a fully tapered, shaved down meet. One of our older swimmers did a big PB in a very close race in the evening finals. He was racing someone all the way to the wall. Fast forward 8 weeks and that same swimmer was swimming in the morning heats in a meet we barely rested for. Yet despite having absolutely no competition in the heat, he missed his PB by only 0.02 seconds. It was a great swim. And yet he was devastated to the point that it affected later races. As much as we’d like to think we can ignore everything in the pursuit of speed, sometimes mundane things like being sick or just getting over it, recovering from an injury, or even swimming during exam time can affect our racing. Swimmers invest so much importance in qualifying times. So much so that too often they’ll consider a whole season to be a success or failure based on meeting those times. And yet this completely disregards any progress that was made during the year. As far as an individual is concerned, qualifying times are just arbitrary times that have no bearing on the potential of a swimmer. Being 0.01 seconds over doesn’t mean the season is a failure, just as being 0.01 seconds under doesn’t mean the season is a success. It’s all relative to how much the athlete improved as a swimmer and as a person. The standard line about developing swimmers is that they can usually fall into the water and still do a PB. And yet the reality is that their strokes are often so inconsistent that they can just as easily add a lot of time as take off a lot of time. We have one young swimmer who we seriously think is trying to find all 1000 ways to swim breaststroke, even if it has to try 3 or 4 completely different styles in the same race. As a result, we never have ANY idea what his time is going to be like. There are many situations when the time really doesn’t matter. Winning matters. Typically this takes place in big races, and when trying to make a team. You’d think swimming your fastest would give you the best chance to win, but strangely that’s not always the case. Sometimes you know that your PB isn’t going to be enough, and you have to try something different hoping it works. It might get you to swim faster, but it also might throw others off their game and cause them to swim slower. In any case, time really isn’t important in these cases. So why is this obsession with time unhealthy? I’m sure all coaches have had swimmers come back from a fantastic race, and been so focussed on the time, that they can’t see the good and bad things about the race. They don’t realize this narrow viewpoint defeats the whole learning and experiential purpose of the race. How was their underwater, their turns, their breathing pattern? Were they successful in speeding up the 3rd quarter of the race? Did they notice that they developed a new stroke problem coming out of the turns? Or did they just notice the time? Even coaches, myself included, can contribute to this problem by praising the race time when the goal of the race was something different. If we tell them the goal of the race is one thing, we shouldn’t confuse them by focusing on the time afterwards. So what’s the take away from all this? Basically, all of us, swimmers, parents AND coaches should start looking beyond the race times, and think about what the goal of the race was. Often, it has nothing to do with the time. Here’s an addendum to the post. My wife read it and said to me that I make this problem worse all the time.She noticed that whenever we have a big meet, I publish the PB rate. And that habituates the parents to accepting PB rate as the key indicator for team success. She has a very good point. I’m just not sure what to do about that now…. Couldn’t agree more. There’s far too many “soccer mom” parents out there pushing their kids into believing that their PB or winning the race are the only things that count – so they can crow about how wonderful and successful their kid is to anyone who’ll listen. The only two things that I care about with my kid’s swims is that he enjoys it and puts full effort into doing his best and he knows this. As a result of this he gets slightly disappointed if he doesn’t better his PB or win the race but accepts it, unlike some other kids who I’ve seen throwing their toys out of the pram if they come second, don’t beat their PB or – god forbid – both. If you apply the writings above to your coaching I’m confident you’ll have a lot of very successful individuals – and I mean all-round successful individuals, not just results-obsessed winners.